Within the past 5-10 years, veterinary medicine has seen some significant improvements in treatments for the ailments commonly faced by ageing cats. Like people, cats do not live forever. They age at different rates – some slow down at the age of 8, others remain spry into their teens or early twenties. An elderly cat grows thinner; its backbone, hips and shoulders become more prominent as it loses the insulating layer of fat under the skin. It may become rickety or unsteady on its back legs and its senses are less acute. These are all signs of "winding down". Older cats exercise less and sleep more, they groom less thoroughly and less often. They lose their appetites. The early stages of this decline are so gradual that owners may not notice it. Recognizing subtle signs early on can slow the rate of decline, but at the end of the day, ageing and death are natural processes and unlike humans, cats do not seem to fear the end. The average cat life-span is 12-14 or 14-16 years depending on which studies you read. Pet food manufacturers recommend senior formulation foods for cats over the age of 8 and many vets consider the cat geriatric when it reaches 10 years old. Generally, once your cat is over 12 years old, it is an ‘older cat’ and its needs and habits change. 6-12 months 12-15 years Sexual maturity, most females now fertile and able to have young although they may not be fully-grown. 6-9 years 40-52 years Middle age spread, menopause for some women. 13-17 years 65-85 years Active but ageing. Signs of senility in some individuals, senses less acute, injuries heal more slowly or incompletely. Internal organs less efficient. The figures are based on veterinary and behavioral research, though as with all individuals there is a wide degree of variation and there are always exceptions, with some cats and humans enjoying a robust old age. Some individuals mature earlier or later than average and some remain active while their age-mates are taking life easy. Ageing is a natural process. The body processes wind down and some functions (reproductive ability) and faculties (hearing, cognition) diminish or are lost. The metabolic rate declines and everything slows down. This makes an older cat less tolerant of anesthesia and certain drugs and less able to regulate body temperature. It feels the cold more and suffers more in extreme heat. Its calorie needs decreases but the need for easily digested protein increases because its digestive processes are less efficient. Physical signs include: cloudy eyes, hearing loss; thinning fur; feels the cold; loose skin; prominent spine, shoulders and hips; loss of muscle tone; stiff joints or lameness and gray hairs around the muzzle and in coat. Behavioral signs include: less tolerance of environmental changes; sleeping more deeply and more often and generally being less active. Some older cats become more irritable or cantankerous due to deafness and/or joint pain, while others mellow with age. Most become more laid back and sociable with those they regard as friends. These are all age-related changes, but sudden mood changes may indicate illness or injury. A cat which starts hiding, becomes unsociable or which seeks constant reassurance may be unwell, so ask your vet to check that all is well. Many older cats remain active in their teens or twenties, though ageing cats tire more easily and start to take things easy. They should be encouraged to take moderate exercise to keep them healthy, but play sessions are shorter and more sedate with little of the athleticism of youth. Reduced exercise means you must trim his claws more often (see later). Older cats are often very companionable; enjoying attention and relaxing in your company so it can be a rewarding time for you to indulge your nurturing instincts. Ageing cats adapt their lifestyle to cope with any incapacity; slowing down gradually, seeking warm, comfortable spots and spending more time asleep. They sleep more deeply and are harder to rouse, so don’t suddenly disturb a sleeping cat or it will be startled, especially if its hearing is fading. This deep slumber also shows that the cat feels safe. As cats grow older, stiffer and lose muscle tone, high surfaces (windowsills, shelves, kitchen counters, your bed) become inaccessible unless you provide a ramp or box as a stepping stone. Tables and counters may become cat-free zones and ornaments be are less likely to be overturned. The cat’s curiosity is unabated, but he no longer exerts himself or his muscles are not up to the jump. Instead of active pursuits he may turn his attention to socializing quietly with you. He may prefer to sit near you rather than on your lap. This is not a snub; depleted fat stores means he is bonier and finds your lap uncomfortable. 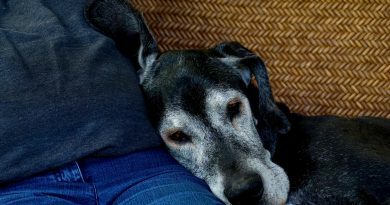 Put a cushion or folded blanket on your lap to make it more comfortable when he wants a cuddle. If he is allowed in the bedroom, spend an half-hour or more sitting up in bed reading with your legs tucked under the duvet or quilt – he will find that the duvet makes a supportive "hammock" between your legs. Fleece-covered cat hammocks are comfortable, but make sure he can get in and out of it easily. Older cats often become talkative, spending less time physically active and more time expressing their opinions. Some are seeking reassurance, but others take a chatty interest in your activities. Not only do they enjoy your company, they tell you how much they enjoy it! Some of the increased vocalization (especially increased volume) is due to deafness – the cat literally can’t hear himself speak. Extremely old cats may become forgetful, suffering "senior moments", staying outdoors in bad weather or wandering and becoming lost. These are signs of senility though the cat may enjoy several more months of reasonable health if senile behavior can be managed. Cats which wander and become lost should be confined indoors for their own safety. If you have an escape-proof garden they can venture out in good weather or they may go out on a harness and lead. A senile cat which house-soils should have a veterinary check-ups to determine whether this us a physical problem or senility. Providing several litter trays around the house may help for a while, but when age-related problems become too acute you must review the cat’s quality of life and consider euthanasia. Although the senses decline, old age doesn’t always mean disability. In cats, the disability usually occurs gradually enough for it to compensate. Even sudden disabilities (amputation, stroke) are less drastic than you might think because an older cat is generally less active and notices his limitations less than an active, younger cat. As a cat ages, sight and hearing deteriorate, often so gradually that you don’t notice anything until the loss is total. A deaf cat is easily startled because he can’t hear you approaching. He sleeps more deeply because the lack of sound gives him a false sense of security. Deaf cats can learn to recognize hand signals or the flashing of a torch (flashlight) to call him in for meals or at night. At close range, sharp hand-claps may still gain a partially-deaf cat’s attention. Deaf cats cannot hear danger signals such as cars, lawnmowers or barking dogs. If he goes outdoors (or could escape outdoors), make sure he wears an elasticated (or break-free) collar bearing his address and write ‘I AM DEAF’ on the collar to help people who find him on their driveway or in their garden. A noisy collar bell helps you to locate him when he is in motion. It is safest to confine a deaf cat to a safely fenced garden or indoors. Blind cats rely on scent and memory to find their way around so keep furniture, food and litter in the same place and don’t leave obstacles in unexpected places where he could walk into them. Carrying a blind cat around will disorient him so if you do move him, place him at floor level somewhere familiar e.g. his feeding or sleeping area so he can easily get its bearings. Sound is very important to a blind cat and many enjoy playing with jingle toys or rustling paper (e.g. paper grocery bags). How Can I Prolong My Cat’s Life? Ageing is affected by both genetics and environment. Good genes are down to luck or careful breeding, but the environment can be managed. There is a danger of becoming paranoid – whatever you do, you must accept that your cat is not immortal. Keep a diary or file detailing your cat’s vaccinations, diet and weight. If you can, record its heart-rate, breathing rate and temperature – your vet will show you how and tell you what the normal figures are. If your cat becomes sick, injured or behaves unusually make a note of this since cats often behave totally different in a vet’s consulting room! Your observations will help the vet work out what, if anything, is wrong with your cat. Some cats do developed unexplained and harmless behavioral quirks, don’t panic – this is called "being a cat". Some diseases are hereditary and reduce life-expectancy. Genetics is a key factor in determining the rate of ageing, how well cells multiply and how well the body repairs itself. Providing good health care for your cat right from kitten hood assures its genetically determined life span. If you don’t know much about your cats past history, the "good health care" routine starts with you! Cats are resilient creatures and many rescue cats reach advanced ages, especially mixed-breeds as these have "hybrid vigor". Breed influences longevity and Oriental/Siamese breeds appear to live longer than Persians. Years of selective breeding has had the side-effect that some breeds are genetically predisposed to conditions which shorten life – the reverse of hybrid vigor. Where outdoors is too dangerous, an indoor lifestyle prolongs life. Where outdoor dangers are moderate or minimal, it is up to you to judge whether your cat should enjoy outdoor pleasures. Remember – your cat lives for now, help him enjoy every minute of ‘now’. 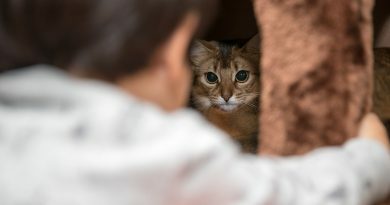 Some people consider the risk of infectious disease means indoors-only, others accept that the risk to a neutered cat is relatively small and that fatal accidents also occur in the home. Weigh up the risks and make an educated decision. What is right for your locality may be wrong for someone else’s locality. Neutering and vaccination are important. Neutering extends a cat’s life-span and reduces the risk of contracting several deadly viruses. Vaccination protects against some of the diseases prevalent in your area. Good diet, good observation of your cat’s habits and regular health checks are vital. Older cats are less active and have a reduced metabolic rate, so you must adjust their food to their decreasing activity level to prevent obesity. Noticeable or sudden weight loss signals serious problems so be aware of your cats normal weight and note any changes. Only prolong relatively healthy or active life, never prolong the life of a suffering cat. The subject of euthanasia is discussed later.